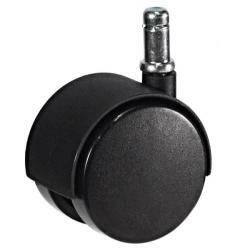 We supply a variety of both rubber and plastic chair castors each manufactured to high quality standards. You will need to consider the type of flooring prior to purchasing furniture castors, as non floor marking castors are available throughout our range, ideal for use on laminate flooring. Whether you have luxury office chairs or standard, our range of strong swivel castors, designed for easy mobility will fit perfectly. 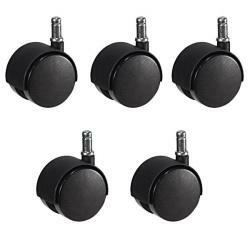 Both 100% nylon plastic chair castors and rubber tyred castors on nylon centres are available, depending on your personal preference. Each chair castor has a simple knock in stem to ensure the castor fits securely on to the office chair. Each twin wheel is capable of withstanding a weight capacity of 45kg, with a 50mm wheel diameter. 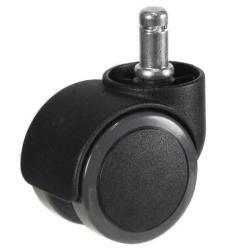 Our swivel castors are designed for regular daily use, as we appreciate how worn castors can become overtime. 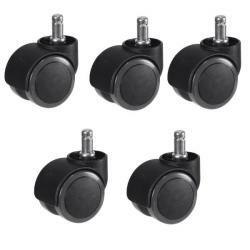 We supply castors in sets of 5 or individually, both at amazing price value. Have you heard about our lowest online price guarantee? If you have received a quote for the same product from another company and challenge us to match or beat it, simply give us a call. Please contact our team if you have any questions about our office chair castors, or select our product images to view specifications. Next time a chair castor breaks, you know where to look.